Who doesn’t love tigers? 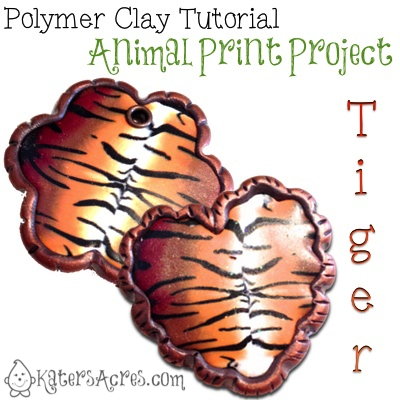 I love them and what better way to show your love of tigers than with a tiger heart. First, make your tiger cane. Cut two equal slices from your cane. Roll out a piece of black clay on a thick setting of your pasta machine. Place them top to bottom on a piece of black clay. Using an acrylic roller, roll the cane slices into the clay creating a veneer. Place your cutter on top of your veneer. Press down into the clay. Remove your clay shapes from the remaining backing. Trim the edge in a similar color of clay OR wrap with a clay ribbon to blend the seams. Dust the trimming with mica powders. Adhere a pin back to your heart shape using Bake & Bond. Bake in a 275 degree oven for 30 minutes. Seal your pin with a coat of varnish. Repeat the above steps with any shaped cutter of your choice. Be creative in your choices. Feel free to make brooches or ornaments as well.